Emerging University of Lethbridge artists show their work at Everything is Temporary: The university of Lethbridge Annual Student Art Exhibition opening March 3 in the Dr. Penny Foster Building downtown. “There are 25 students involved, though some have more than one work,” said fourth year student Amy Parks, who is co-curating the exhibition with fellow fourth year student Ildiko Barraclough as part of their BFA museum curating program. “They went through a jury panel which examined many submissions,” Parks continued. “We wanted works a that really explore the serious issues in the world,” added Barraclough. “We have some really exemplary local artists. We have some indigenous artists and some artists expressing the hybrid of the Japanese Canadian experience,” she continued. Lethbridge artist and writer, Rick Gillis officially releases his new novel “The Boy Who Couldn’t Die” at Casa this Saturday, March 4 from 1 to 4 p.m. The novel is loosely based on his life growing up in the Crowsnest Pass in the 1950s and 60s. It was a time when the Pass was a booming coal mining and lumbering centre. The novel, titled traces a period of time in the life of the Callaghan family, more specifically that of Little Ricky Callaghan, as told through the memories of his older sister, Kathryn. The novel runs its reader through a rollercoaster of emotions, from humour, love, sadness and a surprising twist to its plot line. “Though the novel draws upon my own life experiences growing up in that neighbourhood, the story line diverts sharply from reality as the tale unfolds,” says Gillis. “It definitely is not your standard fare, since few elements resemble anything close to a formulaic novel. Much of it seems reminiscent, but it is far more than that. As ridiculous as it appears at times, the anecdotes as told through the memories of Kathryn Callaghan are all, without exception, true, though at times altered or embellished in the interest of good story telling. “To say that my decision to return home to write this novel was inspirational would be an understatement,” Gillis added. In addition to being made available locally, “The Boy Who Couldn’t Die” is also available on line through Amazon.com (not Amazon.ca) as well as http://www.createspace.com/6890547. New exhibits opening at Casa this weekend show the diverse artistic palates of three different artists. Local artist shows both his dark side as well as his more whimsical side in his exhibit, “ The Age Of Man,” on display on the second floor of Casa in the concourse gallery. The exhibitions officially open, with a reception, Jan. 7. They run until Feb. 18. The Age of Man includes two cabinets of sculpture created out of found items as well as a series paintings hanging on the walls of a more lighthearted, pastoral nature. “I used to work in a mine. There]s wood salvaged from a mine. There were a lot of widows and husbands injured from working in the mines. So this is a comment on that,” he said of one of the pieces. Another piece also created out of wood salvaged from a mine featuring a face peering through a roughly hewn wooden window, is about the plight of immigrants coming to Canada from Europe. Anybody who has a great great grandfather or grand mother mother who came here, they probably come over in steerage and that was not a peasant experience,” Gillis commented. 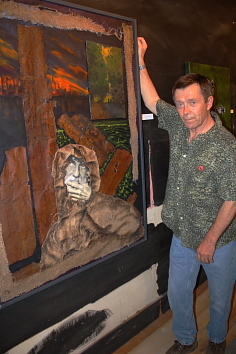 “The paintings are a little more lighthearted,” he said, indicating a series of paintings reflecting tranquil scenes and memories of the past. Janice Rahn was inspired by the intricate details of poppy pods for her exhibit “Composition in the Shape of A Pod: surrounded by exquisite detail. 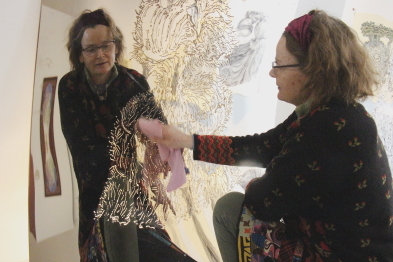 The exhibit includes a variety of lithographs, sculptures, textile prints and etchings on steel and mirrors placed throughout the main gallery inspired by a variety of her passions including traveling, teaching, gardening and history. There are some of her sculptures set in the middle of the gallery, etching on burnished steel on the west wall and prints on the north wall. The back room has a display of curiosities. A group of Lethbridge artists have repurposed an old school to make art together. Jeanne Kollee and Rick Gillis have made the decommissioned McNally school their artistic home for the past two years with a cadre of artists including Ann-Laure Djaballah, Aaron Hagen, Pam Vera , Leila Armstrong, Annie Martin, Kasia Sosnowski, Wende Luco and Robert Bechtel. Each of them took over a former classroom in the renamed McNally Community Hall, located two kilometres south of Hwy 4 on McNally Road, though Kollee and Gillis share a room, while Bechtel shares the basement with the stained glass guild. It is a beautiful setting for studio, the old schoolhouse, which was built in 1947, is nestled in the countryside just at the edge of Lethbridge. The floors are beautiful hardwood and the artists have hung their art on the walls of long halls which used to host rows of student’s lockers, which were removed and sold when the school was decommissioned in 1989. “ All of the works are allegorical. Just about all of the pieces were created here or my basement. There are a number of paintings and a lot other projects and I’ve assembled some photographs for it. 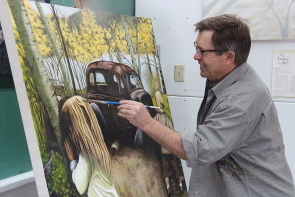 I’ve been working on a more sentimental series,” Gillis said, adding he is pleased with the new space. “There’s lot of room in the halls to organize works for exhibitions, so all we have to do is truck it out,” Gillis said. Kollee is continuing work on her “Unter Dem Messer exhibition which ran June 25-Sept, 2 at Casa. Kollee and Gillis were part of a collective of artists called the Potemkin Collective, which used to work in the basement of the old firehall downtown. When the firehall location became untenable, they moved to a location above Adam’s bookstore. But when the landlord sold the building housing their studio above Adam‘s bookstore and the group disbanded, they had to move again. “We‘ve been using a lot of different spaces for art, which we used to do all the time with the Potemkin. So we were looking for a space when we moved out of the space above Bob’s bookstore, and this place came available,” Gillis said, adding they discovered the location through the Allied Arts Council. Leila Armstrong and Robert Bechtel were already ensconced there.